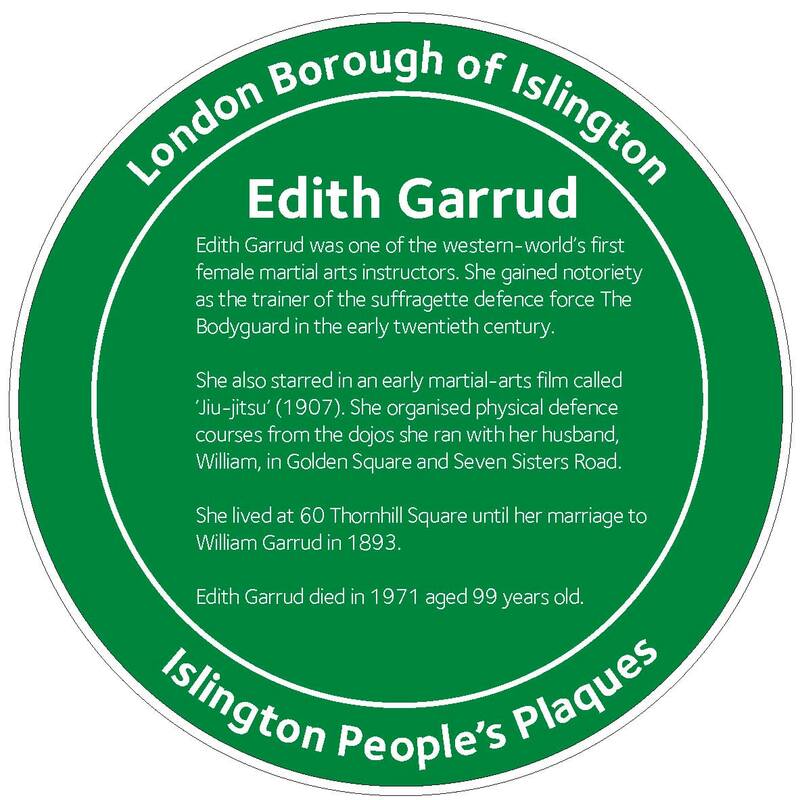 One of the people’s plaques chosen in the vote in 2011 was for Edith Garrud (1872-1971), the suffragette and jujutsu teacher who lived at 60 Thornhill Square. Wikipedia has an account of her life. 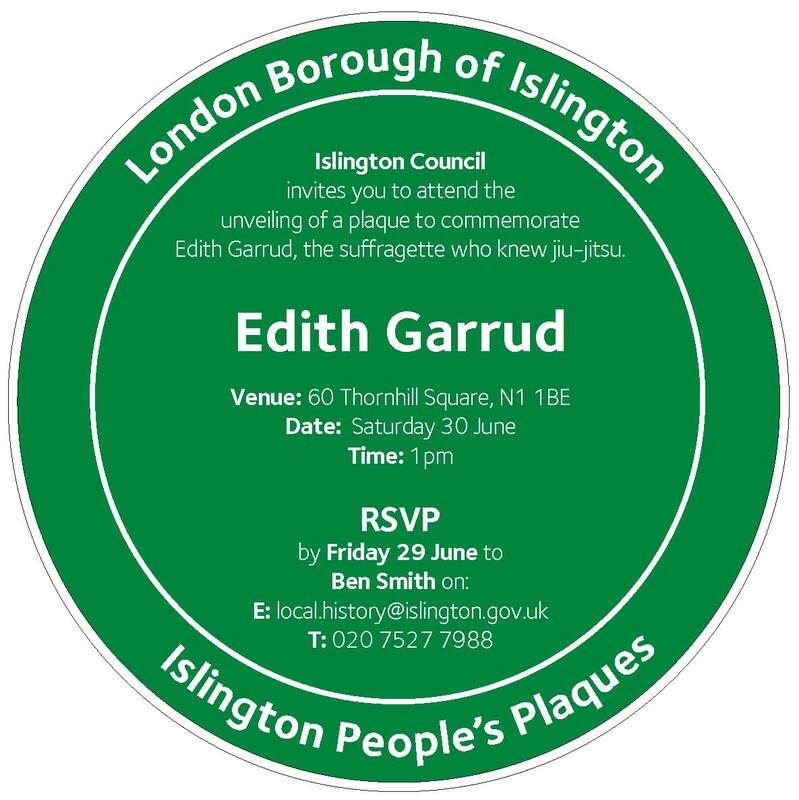 The plaque is to be unveiled outside 60 Thornhill Square at 1:00 pm on Saturday 30 June. After the unveiling there will be a reception at St Andrew’s Church, a short walk from the house. The house was later occupied by Lisa Pontecorvo (1944-2008), who is commemorated here. Hello. I am so excited, having just today found your web site. I am the great great granddaughter of Mr George Sydney Smith Williams (GSSW), who built parts of the square and dozens of other streets, and his wife Mary nee Fallover. Please can I see the document in which you found him? GSSW moved to live in the square after building parts. Most of his second set of children were born there. He later retired to Hove with his second wife Catherine and his younger daughter Frances. There they brought up their grandson/my grandfather Henry, whose mother Annie had died when Henry was aged just one. At the age of nine, Henry boarded at ‘first’ school in Hove with Winston Churchill. Henry’s first wife was distantly related to Churchill, so I think that they must have met at Churchill’s family home or some such. So you can see that GSSW was a very successful Victorian businessman: his children and grandchildren continued to prosper. Sadly, my father, who, like Henry, attended public school and Oxford, turned against all that! While I was still a toddler, he threw away everything that the family had worked for over several hundred years! I have further information on my family that you might like to know re the building company. For now: number 32 was the company headquarters and my family’s home also. My great great grandfather built it as it is so that his clients and employees could turn right into the office (now 32a) and the family could turn left into their home (32). The clients’ servants, horses and carriages could use the mews behind (now off Matilda Street). I have sent one letter to 32 and 32a Thornhill Square, asking for further information on the house. I hope they pass it to each other and respond to me. Please will you also? I am not clear from where the information about GSSW reached you. Do you have some documents that I could see please? 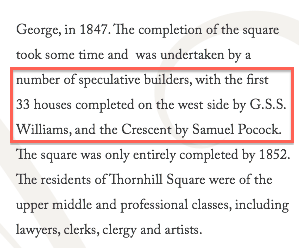 George Thornhill initially planned to develop his Islington estate in 1808, but after a false start he appointed Joseph Kay as surveyor in 1813. When George died in 1827, his son inherited his father’s bequest for improving land in Islington. Street names in the estate recall family connections. Thornhill Square was begun in about 1847; the railings of its central gardens date from about 1852. Thornhill Crescent was begun in about 1849. St Andrew’s Church, in the central gardens of Thornhill Crescent, was built between 1852 and 1854. Early residents were well-to-do professionals. As time progressed, the area became run down like much of Islington, and in 1955 the family interest died out with the death of Captain Noel Thornhill. Thornhill Square and Thornhill Crescent form a large ovoid ellipse, which is a great curiosity in plan. They are largely intact. However, in 1906 two of the houses in the north-west of Thornhill Square were demolished for the new Islington West Library, designed in Art and Craft style by E Beresford Pite. The central gardens of Thornhill Square were open only to key holders until 1946, when Captain Noel Thornhill donated them to the public; they were opened by the Mayor of Islington in 1947. They were newly laid out in 1953 under the Council’s Open Spaces Scheme as part of the Coronation Year improvements. This information comes from Mary Cosh, An historical walk through Barnsbury, Islington Archaeology and History Society, 1981.